I finished my April pyjama pants a little early. Let’s do the chronological thing and start with March. 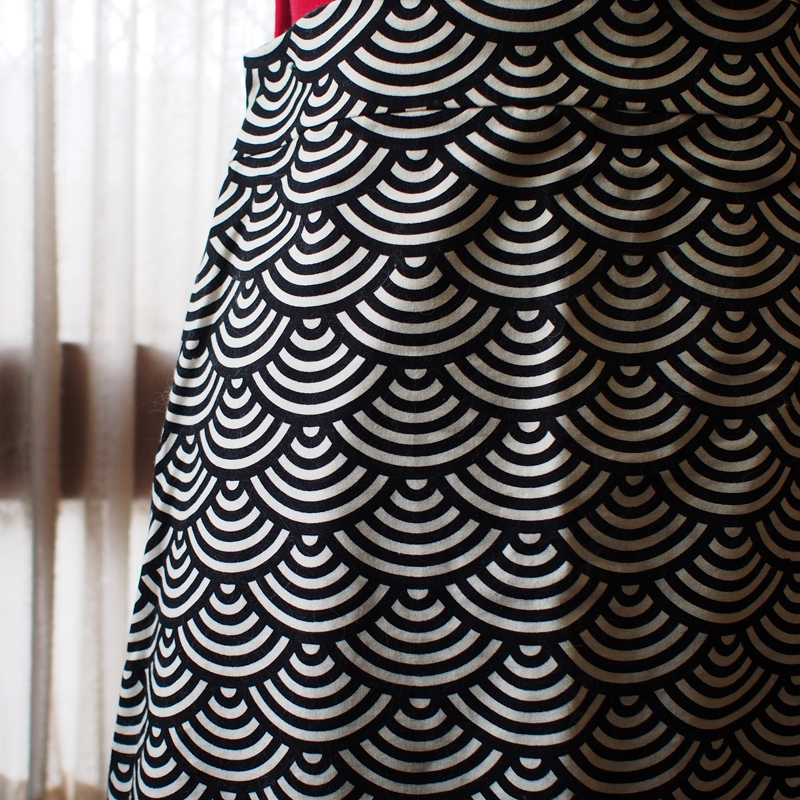 I decided it was high time I finally made the Delphine Skirt from Love at First Stitch by Tilly and the Buttons. High time indeed, given that I bought the book last May and purchased the fabric not long after. 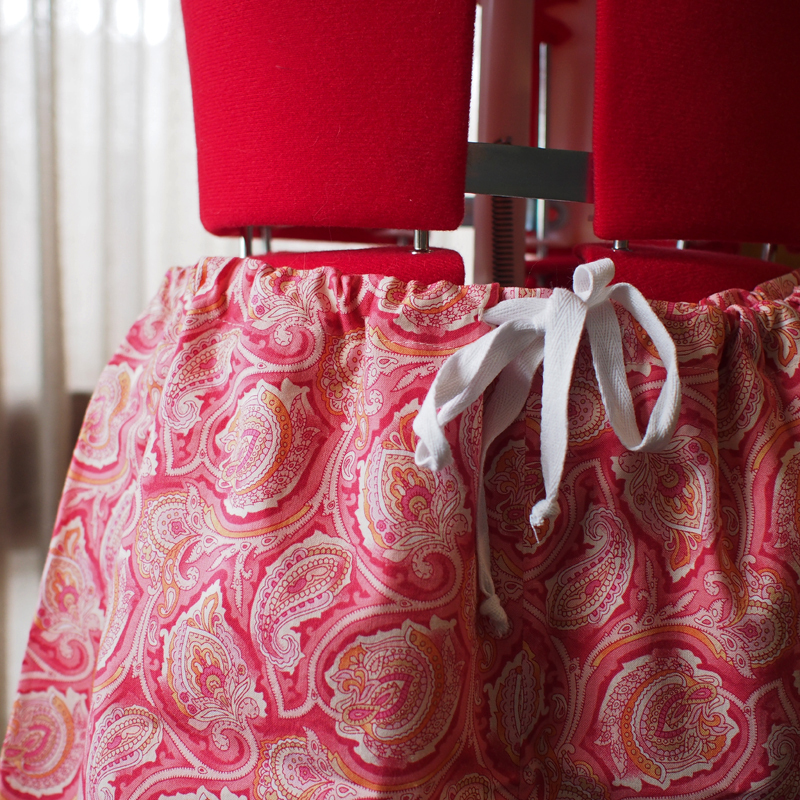 From the first time I saw a picture of this skirt, I knew it was my kind of skirt. High-waisted? Yes, thanks. A-line shape? Don’t mind if I do. I chose the fabric because it was a drill with a bit of substance but mostly because the pattern hinted at the shape of the skirt itself. It’s a lovely, simple pattern that shouldn’t have taken me an entire month (and possibly a couple of days over) – that was entirely due to laziness. The pattern called for a nine inch zip, but zips here only come in either eight or ten inch and I chose the former. In retrospect, I should have chosen a ten inch zip and just shortened the opening a little, because it’s a little snug when pulling it over the hips, but it fits fine. I changed a couple of things along the way. There was a small rebellion when I chose a normal dress zip instead of an invisible zip. This was done for two reasons: a) I don’t like invisible zips, and, b) I don’t have an invisible zip foot for my machine. Even though the second reason is more valid, the rebellion was mostly based on the first reason. I used the hand-picking method, of course, as we all know this is my new favourite way of doing zips while providing my cats with extra opportunities to go to sleep on whatever I happen to be sewing. I also understitched the facing for the waistband because it makes a crazy amount of difference to how it sits, given that it’s a relatively simple thing to do. Do I like the skirt? Indeed I do and I suspect I will make a couple more. The only issue I have is that there’s far too much ease at the waist, which makes no sense. I chose the pattern size based on my waist measurement! When I make my next one, I’ll have to pay more attention to that area and make sure it’s right, because I love the style of the skirt. This brings us to April, which was exciting because I’d chosen a project that would make use of the generous bounty of fabric sent to me by Sew Celia. I planned to make a pair of pyjama shorts from a brand-new pattern I bought for fifty cents at an op shop. Little did I know I’d complete this project in one weekend, if that. The pattern is Simplicity 4319 and it was insanely easy to make. I omitted certain things such as a ribbon around the bottom of each leg and a bit of elastic fastened to the drawstring. In my world, you either have elastic OR a drawstring; there is no room for both. Oh! This garment also features my first ever buttonholes. I’ve been putting them off forever because I found the idea vaguely terrifying, but they’re nowhere near as scary as I thought. The only problem is that my machine has a four-step buttonhole and the fourth step is kind of rubbish. It will be interesting to compare that performance with my brand-new but completely old buttonholer for my treadle machine. So here we are: I’m all done and dusted before the month is over, for the first time this year. And given that I still have a few days before April is over, I’ve decided that there’s only so much time I can waste sitting around feeling satisfied about my achievement. This is time that would be better put to use by making another garment. And seeing as I’m spending an inordinate amount of time baking lately (when applied to me, ‘inordinate’ roughly translates as ‘any’), I’ve decided to use another of those fifty cent patterns and a different piece of material from my donated stash to make myself an apron. Then there’s the extremely pink pinwale cord I’ve bought that will eventually become a skirt, but that’s a story for another day. I’m pretty sure the level of pinkness involved requires some sort of gentle lead-up. And possibly sunglasses. All in all, the Delightful Dozen score sheet is looking rather healthy: I’m four months in and I have four garments to show for it, with one more to come soon. Huzzah! I love those shorts! I’ve been hanging to see what you would make. And I have serious envy of your op-shops. No-one around here parts with their patterns, so there ain’t none nowhere to be found. This went one step further: the op shop in question seemed to have picked up a batch of old stock or something because these were brand-new, un-touched patterns… for fifty cents a piece! I’m glad you like the pyjama shorts! It seems like it’s taken me an age to get around to making anything from your stash but I can assure you I have plans for a lot of the other material, too. Also, I had plans of modelling the shorts with my over-sized space invaders t-shirt in true classy style, but weather and time prevailed against me. That’s mint! You’re so lucky. I hope you bought lots!! Absolutely – I picked up eight patterns! There were a lot of sleepwear and aprons, for some reason, but that was fine wtih me. You absolutely cannot lose with a brand new pattern for fifty cents. Well done you! They look absolutely divine. I love the pj shorts, and I’m with you, it’s drawstring or elastic! Invisible zips are devil spawn, I swear. I still can’t work out why you’d want to go to the bother of attaching a bit of elastic to drawstring. Wouldn’t it just add a layer of weakness to the whole thing? I was happy with my act of rebellion there. So many people seem to love invisible zips that it’s nice to hear of other people who don’t. I don’t mind if people can see there’s a zip on my dress or skirt! One would think that, but some people aren’t forward thinkers, they’re in the here and now thinkers. I don’t mind either! Plus, if you’re super talented, or if it’s in the pattern, isn’t there a little fold of fabric that can help to conceal a regular zip? Pish posh to the invisible zip! Indeed there is! If I do a hand-picked zip properly, it actually conceals the zip quite well, too. And a normal dress zip comes with the advantage of being stronger than an invisible zip. Oh, I forgot to say that I think my comment problem has been solved too! Good job! 4 for 4! You have some lovely prints there. Keep sewing, don’t bake! I warn you baking makes the sewing get snug! Thanks – I’m quite chuffed about keeping the whole project on course thus far. Don’t worry about the baking, though; I’ve probably sewn more things than I’ve baked this year.